Read how my home office became zero-carbon in 2008, and the whole building zero-carbon from 2010! In 2007 I'd been working out how to get my family's entire home carbon-neutral. That's tough (expensive and probably needs too much physical space). But can I do it for my small study/office at home, where I spend much of my working time? This at least would be part of the job done for the whole house, and avoids making a full 'perfect' solution the enemy of a good partial one. I don't want to use carbon offsetting, eg planting trees that nominally soak up some agreed amount of carbon/CO2 (for a while). Rather I want to genuinely and measurably reduce consumption and/or (micro)generate some of the energy that I consume, causing a net reduction in energy actually imported to the house each year. I'd already taken all my office lighting off-grid by the start of this project in 2007/2008. So other than embodied manufacturing energy costs, I'm already zero-carbon there. The Internet Server is sometimes taken off-grid and powered from the system used for the office lighting (eg ~5% of December, ~10% of Oct/Nov) so I have put a slightly lower mean power (25W) than the measured 27W. I only need the WiFi when working away from my desk. I am not generally working all 6 days per week at home, but I'm still often using power for my laptop wherever I am, so I count that energy usage here. As of the start of 2009 the separate SDSL router and WiFi are now one ~8W box (up to 10W with my laptop plugged into a LAN port), so daily consumption on the above metrics is probably below 1kWh/day. The roof on our house is at about 23°, but faces east on one side and west on the other, not south anywhere. This knocks about 15% off year-round collected energy requiring a boost of the panel to ~550W to cover 1.1kW/day average. The collection reduction is especially savage in winter (~50%) when the sun is low in the sky and stays more or less due south. As discussed in Towards a Real LZC (Low/Zero-Carbon) UK Home and Saving Electricity it is probably not reasonable to regard the grid as a perfect energy store, since I will export most power in the summer when UK demand is low and can probably be largely met from low-carbon fuels such as natural gas and nuclear (as well as renewables such as other solar PV), so I probably end up preventing the burning of some natural gas. In winter, when I would need to import, UK demand is high, probably with a higher-carbon-intensity fuel mix, and more strain on (and losses in?) the grid. Thus, realistically, aiming to cover a reasonable chunk (but not all) in winter, and significantly over-exporting in summer to compensate for the difference in carbon-intensity of summer-displaced exported units vs winter/night-imported units (say 0.22kgCO2/kWh for efficient natural-gas-generated electricity now and near-future projected UK electricity carbon intensity, vs 0.43kg+CO2/kWh average UK electricity carbon intensity circa 2007), is probably a reasonable balance and close to carbon-neutral. A 1.1kWp system, ie twice the minimum computed for year-round zero-electricity reflecting the export/import CO2 ratios above, is probably reasonable. This margin can also be taken to cover the embodied energy of the system, probably no more than 20% amortised over a 20-to-30-year lifespan. Note that there is still electricity consumption for the business off-site, eg for hosted Internet servers in several locations worldwide, so any actual excess above starts to make a dent in off-site CO2. Puzzlingly, estimated output from the three suppliers who quoted for the work ranged from well below 900kWh/year to well over 1000kWh/year for essentially exactly the same configuration. It will be interesting to measure actual production. Such a system might cost ~£7000 for an early-2008 install. Installing the PV system on either the east- or west- facing roof slope should in theory generate the same total year-round energy, but putting it on the west slope is more likely to generate energy when I (and our house and neighbours) will immediately consume it, ie in the afternoon/evening, which probably minimises CO2 emissions all round. The west-facing roof overlooks our back garden (ie is not road-facing) and so is least likely to encounter planning problems. As of October 2007 our domestic electricity supplier is Ecotricity and we are on their "New Energy Plus" tariff. We are in London, and thus our DNO (Distribution Network Operator, ie the owner of the local power cables) is EDF. Note that replacing our old domestic fridge/freezer (about 2kWh/day) with a new A or A+ rated one (less than 1kWh/day) for about £500 we reduce our house's net CO2 production by about the same as the PV (ignoring embodied manufacturing energy). I shall get some quotes for a ~1.1kWp PV system to be installed soon, preferably before April when net daily generation is approaching yearly mean. Note that the house has ~25m^2 of west-facing roof area (and the same east), so there is space to (for example) consider thin-film panels which are often cheaper per Wp but require more area. Thin-film has historically had a shorter life-time than crystalline silicon, though that may no longer be the case. Thin-film designs may be able to make better use of diffuse light, helping winter performance. I created a list of possible suppliers/installers using both Google's natural SERPs (search results) and the AdWords (paid-for) listing on the right of each results page. I added in a couple of companies I'd dealt with before for outline pricing, parts, etc. In general I preferred companies specialising in London and the south east UK. 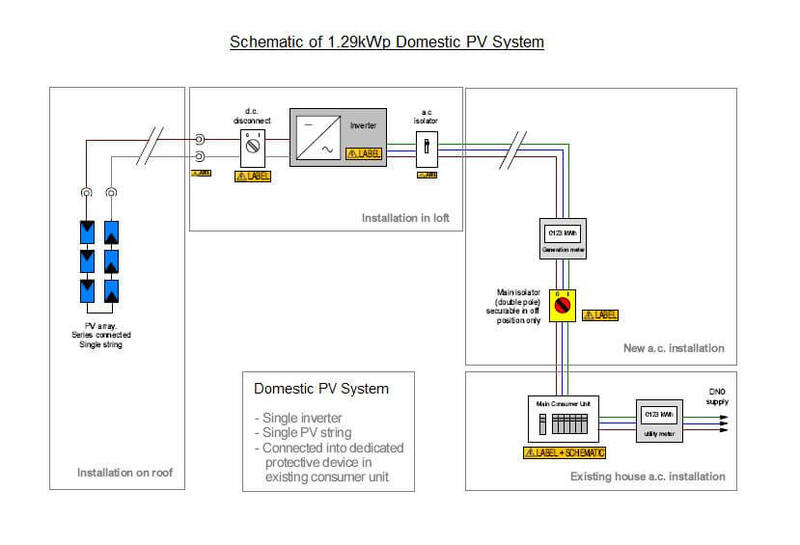 I am interested in having a turn-key ~1kWp (after system losses) grid-tie solar PV install done on a west-facing house roof in London by the end of March, including all such related work as (checking the need for) planning consents and arranging for installation of an export meter. This would probably be paid for by my business as part of becoming carbon-neutral, and grants are not essential to the project being commissioned (though if easily obtained would not be refused of course). I would like you to quote for the work. Note that there is enough available roof area (more than 20m^2 I think) for thin-film PV, which I am interested in if it would still offer guaranteed reasonable (>10 year) life to say 80% capacity, reduce costs, and improve performance in diffuse lighting, ie especially in winter given the absence of south-facing roof space. I will probably have to have three formal (or more) quotes in place by end January to achieve my end-March installation target. In most cases I sent the request by email to whatever address was given on the appropriate Web site 'Contact Us' page. Given that this first round of requests was dispatched in the middle of a long holiday period, it is possible that some will be drowned in a tide of (un)seasonal SPAM. For that reason I also tried to use a specific quotation form if available, which might leave my request less deeply buried, but in most of these cases I wasn't convinced that my request was processed. And one of the forms told me flatly that east- and west- facing roofs are "NOT SUITABLE" whereas PVGIS simply suggests about 20% lower year-round drop in performance (bigger in winter). It might not be ideal, especially for (say) an off-grid system where mid-winter loads must be carried, but "NOT SUITABLE" seems a little strong to me! The PV installers need various photos to help decide on suitability, etc. Here is the west side of the house, about 5m wide. And here are two shots of the north-west corner. The roof is concrete interlocking tiles on a prefabricated wooden truss frame pitched at ~23° (as estimated during a site survey). C/o Google Maps, here is the centre of the roof area that I want to place the PV on: the 5m of west-facing roof at the north end of the north-south row. Note that the continuous north-south roof ridge (10m) covers two houses. The horizontal distance from the roof ridge to the west wall is ~4m, so with a slope of ~30°+ the ridge height is ~2m, and the roof length from ridge to wall ~4.8m for a total area of under 24m^2 (west facing). There are snake-oil salesmen out there, and the usual rude and incompetent too. By 2008/01/14 I'd had two site surveys done by firms quoting me for the work, which indicated that the roof is suitable to bear the panels, and that at a pitch of ~23° will generate a little more power (~4%) than I'd initially allowed for (assuming a 30°--35° pitch). At this stage some of the suppliers had not responded at all, and although it may not be their fault (eg my request buried under SPAM), I've had sufficient good responses not to need to chase up the others. By the evening of 2008/01/18 I have three good quotes in. I shall study them in detail over the weekend. All three sets of quotes now include Sanyo HIT (hybrid) panel configurations, since I think that these will give the low/diffuse/winter performance required while also conserving roof space for possible future RE projects. The quotes are from Chelsfield Solar, Solstice Energy and Evo Energy. On 2008/01/26, following a site survey and confirmation of quote, I signed with Evo Energy for a 1.29kWp system for better than the benchmark figure (the other two bidders were over the benchmark) based on 6 x 215Wp Sanyo HIT panels and an SMA Sunny Boy SB1100 inverter plus balance of system and install, with a predicted output of ~888kWh/year given Evo's PVSYST software (I hope that we do significantly better). There will be a small extra fee to improve our earth bonding. The target install date is for two days starting 2008/02/25. As of 2008/01/07 I have contacted my local council to check for any need for planning consents (etc), and specific permission to alter the exterior appearance of the property given that the council has retained a covenant in the freehold ("...nor erect ... any other structure of any kind ... without (in any of the said cases) the previous consent in writing of the Council ..."). I'm hoping that I have not left this too late for a March install. The council's Building Control Manager pointed out that if the installer is in one of the "Registered Competent Persons" schemes then there will be one less aspect that the council needs to be involved with. The installer can self-certify the building works. He also stated that, with regard to Building Regulations, approval for the PV system will be required and the necessary Building Notice form can be downloaded from the council's Web site. The Building Notice together with the appropriate fee can be submitted up to two working days before the installation takes place. He also directed me to the government's planning portal site. A response later that same afternoon from the council's Interim Head of Development Control said: "Single dwellings have 'permitted development rights' to install solar panels but subject to these not being higher than the ridge of the premises. I note that [your house] is not a Listed Building nor does it lie in a conservation area. Therefore the remaining issue for planning would be whether these panels would be installed on the front roof slope, because if so, they would require approval if they were to change the shape of the roof." As the intention is to mount the panels on the roof facing away from the road, I think that we probably do not need formal planning permission. A separate response that day from the council's Principal Valuer stated that: "In the event there is no objection [from the relevant Housing Officers] I will be in a position to instruct the Head of Legal Services to send you the necessary letter of consent as required under the restrictive covenant." 2008/01/21 I clarified with the council that: "If the installer is a member of a Competent Persons Scheme and is able to certify compliance with all aspects of the regulations including electrical and structural issues then a Building Notice is not required to be submitted to the Council. 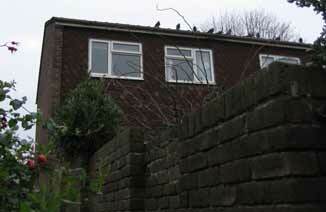 If not, and only some aspects are to be self certified, then a Building Notice should be submitted." So I think that there is probably no more paperwork to be done, and we may be able to bring forward the installation date to test and accredit the system before it officially goes live in April, donating any generated power to the Grid 'pro bono' in the meantime! The council is lightning fast (I only sent in the query the previous evening) and very clear and helpful: long may this continue! 2008/02/04 The council's Interim Head of Development Control confirmed today to Evo Energy that: "These proposals would accord with previous advice that no formal planning approval is required." I spoke to our building society (ie with whom we have the house mortgage) 2008/01/07, and I was told that they did not need to be formally notified about the PV install unless any major structural work was involved (which is not the case). We will need an Ofgem-approved electricity-supply meter when the PV is running, regardless of any arrangements for payment for exported units. Two possibilities are a racheted mechanical meter (can't run backwards) and a full import/export meter (expensive). 2008/01/08 I have contacted our supplier to try to find out what to do, eg find out if our current meter is even safe for these purposes, and their customer-services department will get things sorted out. I have tried previously to find out what needed doing directly with the DNO, but went round and round in circles without a clear answer. Ecotricity's scheme works by it paying for all generated units (4.5p/kWh), claiming the ROCs themselves, and metering/charging imported units as usual: Ecotricity is effectively paying us for the ROCs and getting exported power for free (minus their administration costs), which is fine by me since this is a CO2-reduction exercise primarily. As of 2008/01/18 Ecotricity and EDF seem to have different views about what type (and cost) of meter is needed: Ecotricity believes that a (free) upgrade to a ratched meter is enough, but EDF is insisting that we pay for a full import/export meter: I have asked Ofgem and Energywatch for opinions. As of 2008/01/21 EDF has relented and agreed to do a free meter replacement (presumably on safety grounds) in early February. I spoke 2008/01/21 to Ofgem about this metering issue and it said that under the DNO standard licence condition 4 the DNO must be reasonable and non-discriminatory ('RAND') in such works and charges as meter replacement, although they otherwise have a fair degree of freedom and interpretation as to what their policies are and Ofgem does not regulate this directly. Thus, if a DNO played difficult and tried to charge huge sums of money for a meter safe to use with microgeneration effectively deterring its install, then it might find themselves in very hot regulatory water. 2008/02/11 ~08:05 we had the meter swapped out (in about 10 minutes) for a 1980s mechanical meter, with a digital readout I'm glad to say! 2009/09/21 13:00 to 13:50 BST we had the unratcheted meter swapped out for a pair of (digital, mechanical) import/export meters; naturally the export meter is my side of the import meter so any power consumed by the export meter is charged to me! Given the fact that some electricity will have to be imported (eg at night) for the company's equipment/use and will show up on the domestic bill, but usually during the day we will be exporting since only a little power will be used by the home and effectively cancelled from the domestic bill, the effect on our (post-tax) domestic bill should be broadly neutral, ie as if the company was drawing no power at all. The company will retain any payment from Ecotricity in order to avoid creating an actual taxable benefit, ie this scheme is not for anyone's financial gain. The effect in either direction on metered power will probably be at most of the order of £20--£30 per year (roughly netting to zero). Even though I expect domestic consumption to be fairly constant month-by-month, the imports (and thus bills) will be greatest in winter and smallest in summer. 2008/01/28 Ecotricity posted the forms for us to (pre)register the PV system with Ofgem for allocation of ROCs (for which Ecotricity will be our agent). 2008/01/31 Dispatched form to Ofgem to appoint Ecotricity as our agent for ROCs. Will need circuit diagram plus the make, model and serial number of the generation meter before I can complete Ecotricity's part of the paperwork. 2008/02/01 I returned the forms to Ecotricity without the serial number which I expect to get in a week or so. So far as I know, once the serial number is supplied to Ecotricity and I have confirmed that the PV system is running, there are no more formalities and we're a bona fide contributor to the Grid! 2008/02/04 I was asked by Ecotricity to send them a letter on headed paper to confirm that I am an employee of my company (the ESCo) and that I am authorised to represent it. 2008/02/27 I confirmed to Ecotricity that our system had come on-line. 2008/08/14 We received a letter from Ofgem finally confirming our registration! The electrical schematic (circuit diagram) for the system. The PV array is 6 series-connected (ie one series-string) Sanyo HIT 215Wp (hybrid crystalline/thinfilm) panels for a nominal rating of 1.29kWp. The grid-tie inverter is an SB1100 with Sunny Beam personal display/monitor. The total generation meter is an Elster A100C with 100pls/kWh. 2008/02/25: The physical installation of the panels was completed today, without fuss. 2008/02/26: One important job today is improving the earthing in our house wiring; a good thing to do regardless. Unfortunately, the electrics overran by at least half an hour past sunset so the installers will have to come back tomorrow to finish testing. 2008/02/27: We're up and running and generating a little before 13:00 GMT! Peak power observed so far, by about 2pm on a slightly hazy day, is ~680W. (The DNO seems not to have installed a ratcheted (detent-equipped) meter, so our (import) meter is running backwards at the moment. Some sort of manual adjustment will have to be made to our bill.) The unit is still generating tiny amounts of power up until within a few minutes of official sunset time, with a total of ~1.7kWh generated today. ... And it restarted just after 7am, about 20 minutes after official sunrise. The meter (ie import vs export) seems just about in balance and stopped when the PV system is generating somewhere between 30W and 40W, so that covers the office Interent-facing server and SDSL modem, plus the house wireless phone and bedside clock radio plus the CH/DHW timer clock. The system was inspected (and passed) by an independent assessor 2008/02/29, and will be billed for in 2008/04/02 if the system has proven itself. 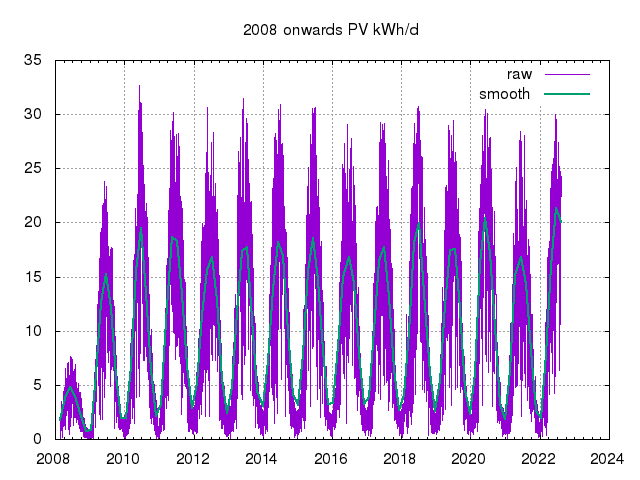 Here I record some notable data points: look at meter records for a more comprehensive summary, and daily kWh generation records with smoothing. 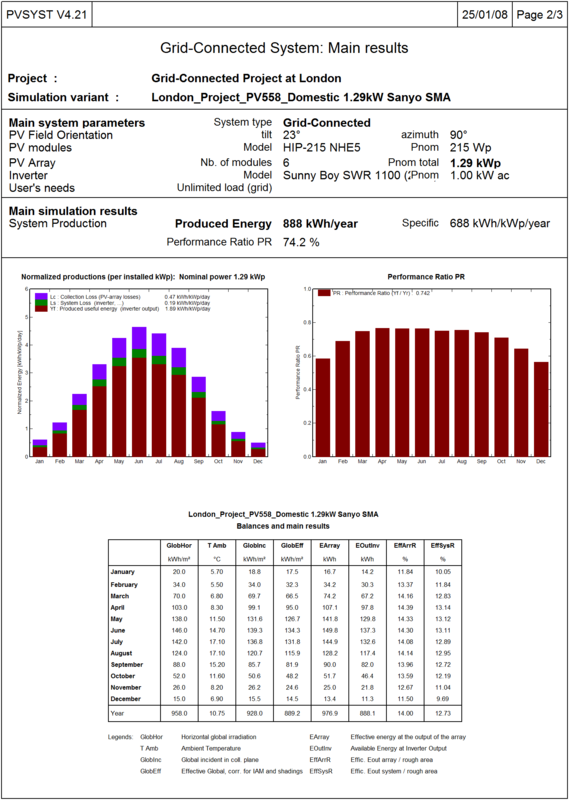 On the first (partial) day the system generated ~1.7kWh, and in the last ~2.5 days of 2008/02 after installation and switch-on the system generated ~4kWh. On 2008/03/01 we generated ~2.6kWh, which is over a third of our consumption. On 2008/03/03 we passed 700W peak power. On 2008/03/05 we generated ~2.9kWh. On 2008/03/07 we generated ~3.5kWh: well over half of our daily consumption! 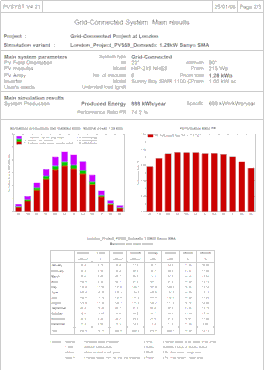 On 2008/03/08 we generated ~0.8kWh and have cloud, rain and gales forecast... On 2008/03/09 we passed 800W peak power. On 2008/03/16 we generated ~0.16kWh on a very gloomy day; the worst yet, and had already generated more by 9am the next day! (With heavy cloud, the system gets as little as 5% of 'nameplate' rating, and maybe 25% under light cloud.) On 2008/03/17 we passed 1kW peak power (and 2kWh generated in total). On 2008/03/21 we generated ~3.5kWh, roughly equalling the best so far. On 2008/03/24 with snow and sun I collected this lumpy data set which shows how fickle the power output is. On 2008/03/27 we generated ~4.5kWh, the best so far. Over the month the system logged 70kWh, significantly ahead of the predicted 60kWh. Note that the Sunny Beam consistently underestimates compared to the total generation meter, in this case by over 1kWh for the month. April got off to a good start with a record to date of ~4.7kWh on 2008/04/01, and the outline of a smooth power curve against time is becoming visible. On 2008/04/04 we generated ~4.8kWh, the best so far. On 2008/04/08 we hit 1.11kW peak power (nominally over the inverter limit). On 2008/04/15 we generated just shy of 5kW. What's becoming clear is that the (unpredictable) cloud/rain/etc makes all the difference between a record day and a lousy one (eg 1kWh vs 5kWh). On 2008/04/17 we generated over 6.5kWh, more than our usual gross consumption. The overall asymmetric shape of the curve from being west-facing can be clearly seen in the log. Total for the month was 108kWh generated exactly, about 10% ahead of the predicted 97.8kWh. If reality remains ahead of PVSYST's predictions by this sort of margin then the system may just scrape 1MWh for the year. On 2008/05/06 we generated over 6.9kWh. On 2008/05/11 we generated a shade under 7.1kWh, the best so far. On 2008/05/13 we generated a shade over 7.1kWh, the best so far. Over the month we generated a little over 135kWh, ahead of PVSYST's prediction of ~130kWh, though a little less than I expected due to a run of very cloudy weather in the last week or so. On 2008/06/04 we generated ~7.5kWh, the best so far, from 0400UTC to 2000UTC, on the first decent sunny day in nearly a fortnight! On 2008/06/08 we generated over 7.6kWh, the best so far, in spite of haze. The longest day (~2008/06/21) was not enough to ensure the largest kWh; in fact it was so overcast and cloudy that output was ~2kWh, though on 2008/06/22 we did in the end scrape 7.6kW exactly. For the the whole month we generated ~160kWh, ahead of PVSYST predictions of ~137kWh by ~16%. In 2008/07 we generated ~161kWh, ahead of the predicted ~133kWh. In a very gloomy 2008/08 we generated ~97kWh, behind predicted output (~117kWh, thus ~20% down) for the first time, but 2008/09 we generated ~85kWh, about 4% ahead of the predicted 82kWh. In 2008/10 we generated ~53kWh, about 15% ahead of the projected 46kWh. In 2008/11 we generated ~18kWh, about 18% behind the projected 22kWh. 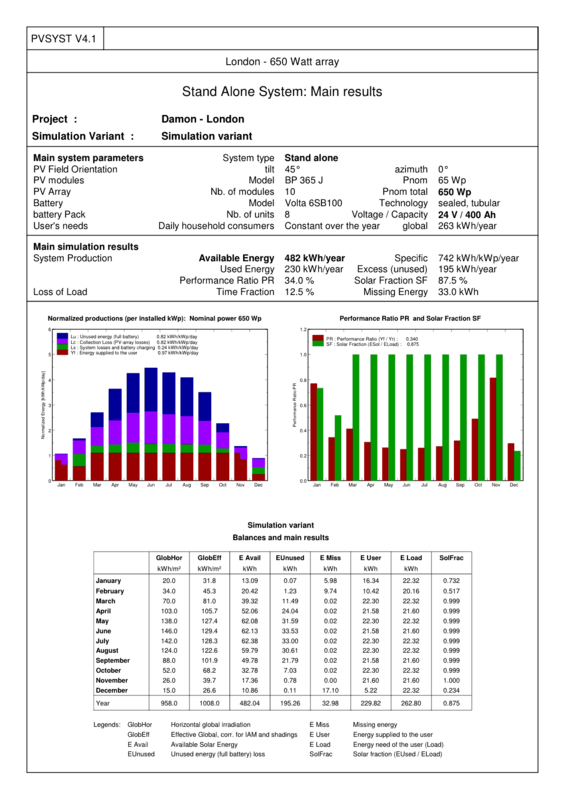 Although August and November were behind projected generation, by the end of November the systen was within a few (4) kWh of the projected generation of 888.1kWh for a whole twelve months, and we can expect to do reach this target sometime in December leaving us with a month or two of 'bonus' generation in hand! December featured the most feeble (50Wh!) day so far with rain and dark cloud and all-round gloom. On 2009/03/01 we passed 1MWh total generation from the grid-tie PV (although the slightly-conservative inverter stats claim a couple of percent less than that, passing 1MWh on 2009/03/04). On 2009/03/06 we generated over 8kWh, which is a new record (with the new expanded system I hope to exceed 20kWh/day in mid-summer). On 2009/03/15 we hit double digits (nearly 11kWh) and the generation graph on a fairly clear and sunny day shows a dip in the morning due to shading on the east side from a tall tree to the south-east; this effect will diminish as the sun gets higher in the sky in summer when more energy is being collected anyway... And in fact by 2009/04/08 the effect is almost gone (at most maybe 5% on the worst-affected string). By 2009/04/26 we have come close to 20kWh for the day. A couple more early May and late May curves on sunny days with output just short of 22kWh (gross consumption ~5kWh/d this month) with the latter showing very early morning shading from a tall tree 50m ENE! Here is a generation curve from a hot and cloudy week in late June, just after the longest day. Despite the continuing relatively poor summer, we still seem to be staying ahead of predictions for generation, and passed 3MWh total some time ago, with the inverter (under)reporting 3.345MWh at EOD 2009/09/02 for example, indicating well over the 2.05MWh output expected since the start of March, thus nominally covering our entire annual consumption, and so everything generated to next March is now a negative-footprint bonus. which suggests that the loss from shading has so far been ~3.5% on set 3. The new string of 1.29kWp on an SB1200 inverter went on-line mid-afternoon 2010/04/26. Having missed a relatively sunny April we finally had our first essentially cloud-free day 2010/05/22 and generated a record 29.52kWh, just beaten the next day with 29.83kWh. Generation is from about 0400--2000 GMT, ie 16 hours. Note that the SB1200 seems to start generating at higher light levels than the SB1100 (so starts generating later each day and stops earlier) but seems to do better at higher light levels, presumably more than compensating. All the SB1100s are very similar in generation curve. 2010/06/13 around solar noon with haze and some cloud I saw brief production peaks of up to 4.53kW (nominal maximum is 4.5kW). Unfortunately the meter is no longer properly responsive to attempts from Linux or Windows to extract data, possibly from passing the 10MWh mark, so I'm having to reset it (at 19:45 BST ish: will need to rediscover all but the newest inverter tomorrow morning). It seems that the inverters remember total generation, so that is not lost. I had lost a couple of readings (1st and 2nd Aug, the first since installation), so entered estimated values from the SunnyBeam display with lower precision to make the imprecision clear. The SunnyBeam did recover and decide to talk to my Linux server sometime before we went on holiday at the end of August, so no more readings were lost, thankfully. The inverters were re-ordered on the display though. 2011/09/23 Near neighbour to the south west has just heavily trimmed a large tree which may help make a few more Wh for both grid-tied and off-grid systems late in the day at this time of year (and again in Spring)! 2011/10/10 The shading effect on panels on the east roof int the morning is roughly at peak from the large tree to our south east; maybe losing 1/2--1/3rd generation, up to a little before solar noon. When the tree sheds its leaves the effect will be much reduced. One string loses much less than the other due to the L-shaped configuration. 2011/10/20 Readings on the SunnyBeam for total generation passed 11MWh. Off-site Internet servers (UK servers are covered by the second phase). Other energy uses, equipment, consumables, etc, not yet accounted for. My typical client visit is a round-trip of ~27 miles by electrified train across London (overground and underground) which produces ~2.7kgCO2, equivalent to ~5kWh of grid electricity. Interestingly this is close to what I might expect if I actually drove an electric car to and fro since these forms of transport are both efficient (less than a third of the kgCO2 per mile of a petrol (ICE) car). As of the end of April 2009 I have 4 off-site Internet servers: London (UK), Altanta (US), Bombay/Mumbai (IN), Sydney (AU). I assume that each server uses ~2kWh/day (albeit with different kgCO2/kWh). I have discontinued use of two servers to trim load (I had 6 off-site), and I could attempt to upgrade to machines with a lower power consumption. I attempt to moderate consumption during local grid demand peaks to reduce CO2 intensity for some of the servers already. Another way to cut CO2 from my off-site servers would be to site them in RE-powered data-centres where available. If I could pay to move a couple of South African families' DHW systems from electricity to solar thermal, that might save ~2.6MWh/year of electricity each, and even just one would be equivalent to most of the electricity used by my off-site Web servers, and would displace a lot of CO2 generation from coal (going by Eskom figures 2008/02/11). As of 2008/02/11 I wrote to an electricity generation company in New South Wales asking if it ran or knew of any local schemes where I could (for example) contribute capital to install extra solar PV panels to feed power into the grid to match my servers' consumption: the prompt and polite answer was essentially "no". Clearly even a couple of client visits per week dwarfs office power usage, as does my farm of off-site Internet servers. Getting my small business zero-carbon would be as hard work and expensive as getting my whole home and family so! Probably in terms of CO2 produced to support on-site energy use, we would meet the "Merton Rule" with this modest 1kWp scheme. There are some benefits to the company beyond the 'corporate social responsibility' (CSR) of reducing its carbon footprint. In future 'green'/'carbon' taxes may make this kind of scheme compulsory, in which case we will have made some of the capex when affordable. There is a small side-benefit in hedging against energy-price increases, though greater protection for the company in this regard would require more PV, and some storage to maximise netting of imports and exports/generation. This project also increases the company's expertise and experience in (small) RE projects, moving towards being able to monetise these skills. As of 2009/02/10 the system has been trebled in size (schematic), with a nominal PV rating of 3.87kWp and an inverter capacity of 3.3kWp. (The inverter capacity will rarely be limiting.) 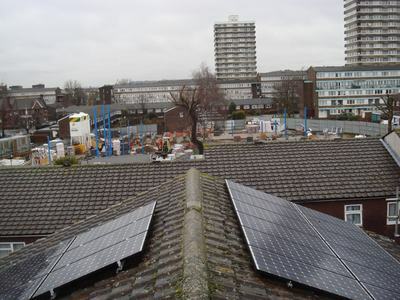 The new installation of 12 panels is on the east (street-facing) roof which as of April 2008 and the extension of "Permitted Development Rights" for such things as solar microgeneration no longer needed planning permission. We did still need permission from the local council because of restrictive covenants in our freehold title deeds, but the council was again very helpful, and indeed also keen to see the data as the project progresses. The system is organised as three identical strings of six panels for 1.29kWp, each on its own inverter of 1.1kWp, for maximum energy harvesting given the radically different lighting that each string is exposed to. The arrangement also maximises my freedom to swap parts around to keep as much of the system running as possible if something fails and/or replacement parts prove tricky to get for whatever reason. The panels have been arranged as two interlocking L-shapes on the east roof to ensure that one string has almost no shading even in winter, with the sun low in the sky and partly obscured by a building due south, so the second string is effectively sacrificial in low light in mid-winter. As an example of the effectiveness of this arrangement, at 2009/03/30 09:05 GMT, with a small amount of shading from the tall tree to the south-east (essentially the shadow of one or two branches ~20m away), one of the strings is running at 288W and the other at 804W; a simple rectangular layout would probably have had both generating under 300W. This system extension is to cover/offset the rest of my company's Internet operations in the UK, approximately, and I will be adjusting my UK co-lo server to reduce power consumption unless the the new PV is pumping energy into the grid, nominally over to the co-lo site not many miles away. The co-lo server (a Niagara T1000) consumes ~100W, ie 0.9MWh/y, and it is reasonable to assume that the balance is consumed by, for example, third-party routers and other telecoms equipment on our behalf. Another way of viewing the expected generation is to have the house export more electricity than it imports over the course of a year, thus taking it approximately carbon-neutral for electricity, including my company home-office use. Both views are reasonable because of the 'additionality' enabled by the company, but a longer-term aim is to make capex (capital) investments in other projects (almost of necessity off-site) with a better return in terms of kWh/£ such as macro-scale wind and tidal projects which are not currently available, to cover other company activities in the UK (eg business travel) and worldwide (such as co-lo servers in other countries), and have us as freeholders buy the solar PV in due course. This will clearly be simpler all round, but the main point was to do as much as possible as soon as possible, not waiting for perfect opportunities to become available! The final roof layout leaves space for solar thermal (hot water), with 2m from the north edge of the roof to the edge of the PV support frame. 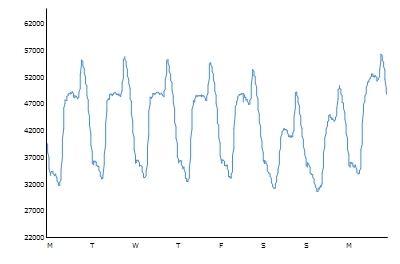 I note that all my inverters are programmed to disconnect from the grid if the mains frequency rises abive 50.5Hz (too little demand to balance), but cling on all the way down to 47Hz (and probable total grid failure), thus providing some 'inverse dynamic demand' stability/support. As of the date of my install, DECC claims that the UK has a total of ~22.5MW of installed PV capacity (DUKES 2009, Chapter 7, p191) which is <0.1% of UK summer peak demand and feeble compared to Germany's 3.8GW! Over March and April another round of PV has gone in (all live 2010/04/26). Due to the change in regulations this will be under the Feed-in-Tariff (FiT). Because the new and old regimes are administratively incompatible that means two separate meters and wiring runs, two sets of readings, two accounts with the supplier, more hassle and paperwork. The new array is in the least-shaded part of the roof that I had reserved, possibly for solar thermal though I decided against that in the end, but the first array had to be slightly re-sited to accommodate the new one. This upgrade brings the total on the roof to 24x215W (5.16kWp) Sanyo HIT panels. The inverter for the new array is an SB1200 since the SB1100s are now obsolete. Since the new panels are in the best location on the site, this slightly bigger iron might allow a little more energy collection. As ever Kingston Council has been very helpful. Building Control wanted us to get our roof structure checked for strength "We know you are trying to do the right thing" but BC doesn't want us squished! It was agreed that we didn't need planning permission (we're still within GPDRs) and Housing that enforces the 'no unapproved changes in appearance' covenant was also happy for us to do this work. A certain amount of disruption during the various phases of the install has meant most generation lost for a couple of days, and all of one string off-line for some days (ie just half the panels in use). There is maybe 1m space below the panels to the bottom edge of the roof on both the east and west sides, so up to a max of about 4m^2 each side free. Some spare rails were left in place, 0.34m (13.5") spaced centres, and 3.07m (10ft) long. Geek out with all kinds of alternative energy! See the on-line PVGIS (Photovoltaic Geographical Information System) Solar Irradiance Data tool. Details of a UK solar PV installation in Herefordshire, UK, circa 2007. 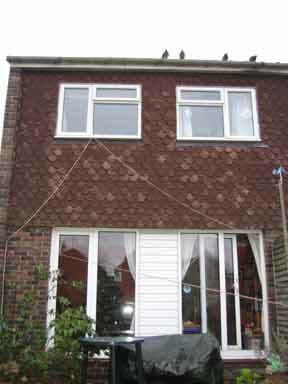 Another domestic solar PV install in Kent, UK, of about 3.2kWp, circa 2006. 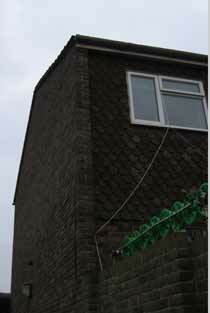 A working solar PV/thermal system in Gloucestershire, UK, 1.8kWp Sanyo HIT, circa 2004. Ofgem: UK regulator of the electricity and gas markets in Great Britain. Solar-thermal / heat-pump combo from E3 Renewables. Write-up on another Evo-installed system, late 2008. Action South Facing (2007/12/29, no response by 2008/01/18). See its handy performance chart for roof slope and orientation. A Building.co.uk 20090130 feature on Evo Energy. The Merton Rule is for carbon rather than energy. Some people are trying to access the Sunny Beam from Linux given its non-standard Windows-only USB drivers. 2010/02/01: UK's DECC announces results of Consultation on Renewable Electricity Financial Incentives. First published 2007-12-29 , updated 2019-04-22 , rebuilt 2019-04-23 . Site copyright © 2007-2019 Damon Hart-Davis. Hosted by ExNet.